12 Days of Xmas, DAY 10. HOME STRETCH people! Happy Saturday Today is first of 3 INSANE days for VFuel – we’ve hit 20% off and what better way to start than with our Mixed Endurance Gels? 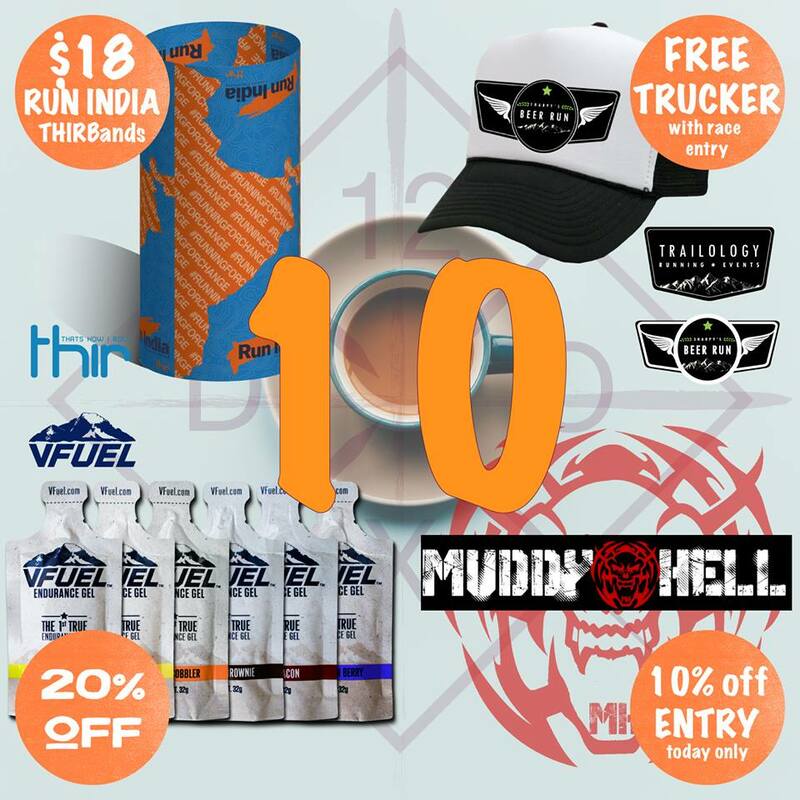 Muddy Hell are back with 10% off entries for Hot as Hell in January, Sharpy’s Beer Run are offering a free white trucker with regos and THIR have slashed prices on their Run India and Trail THIRs. Every day for 12 days we’ll bring you four awesome deals, from VFuel Australia and our partners; local trail running events, retailers, health professionals and maybe even a few surprise guests. Remember, these deals are for ONE DAY ONLY so don’t miss the boat. PLUS: Share the daily #12DoXSale sale along with this Hashtag, and go in the draw for a massive end-of-sale prize pool. Every share counts, so don’t be shy! Happy Saturday people, check these Deals! /// 1. VFuel Australia have hit 20% off MIXED Endurance Energy Gels. Yep, one of every gel flavour! This is the biggest discount we’ve EVER offered. Stock up, gift them, have them on your pancakes just DON’T miss this. It will never be repeated. No Coupon needed, just head over to vfuelaustralia.com and discount is already applied. ///2. THIR Australia have continued to slash prices, offering discounts on their Run India and TRAIL THIRS. These make Perfect stocking fillers and proceeds from the Run India THIRs go towards World Vision projects in India. No code necessary, discount already applied. Posted in Latest News and tagged #12DoXSale, Arthur's Seat, Beer, Footpro, Mornington Peninsula, Running, SBR2017, Sharpy's Beer Run, Trail Run, trail running, Trailology. WE ARE SO PROUD OF YOU GUYS! Sharpy's Beer Run was at The Pig & Whistle. After a good nights sleep, I’m feeling refreshed and ready to think about yesterday’s event. I’d like to start by saying a huge thank you to Deb Sharp for trusting me with her race. It was challenging at times but so rewarding! Caz Donovan, for being the best Vollie Coordinator I could hope for, but also going over and above, to help in anyway she could. Jared Scull for working so hard out on the course, which meant I could focus more on the face hub! Also to the core group of helpers. Including, but not limited to Zoe E England, Elise Rowe, Chris Ord, Matt Bell, the awesome Team Moxham, Andrew Payne, Sim B and all those others who volunteered on the day. It is so much appreciated. To the Pig & Whistle who were such a great help. They provided the best possible venue and atmosphere! A special thanks to James and Chelsea! To our sponsors Mornington Brewery (I’m sure you’ll agree, a great drop), FootPro, Salomon/Suunto, Vfuel and Belura Health, thank you all so much! And, lastly, to you, the runners, you make the whole effort worthwhile! The smiles and laughter and the kind words of thanks is the real reason we do this! What an absolute cracker! SBR2019 was one helluva trail party. Big love and thanks to #thepigandwhistletavern #footpro #salomon #suunto #vfuelaustralia, #beleurahealthsolutions and extra special love to #morningtonpeninsulabrewery for the delicious gallons of pale ale. It wouldn't happen without your support. To all the runners, our wonderful vollies, our hilarious MC's Chris & Matt, our wench Helga, our medics from #endurancemedicalservices, and Port Philip 4WD club for manning the car parking, we are so very grateful for your energy and the ear-to-ear smiles that make Sharpy's what is it! On course photos will be available from Supersport images soon. Head to the website. Race results at at Tomato Timing. Sharpy's Beer Run was live.